A mother gave birth to an adorable baby boy on December 25 but still managed to cook a Christmas turkey feast just hours later. Thirty-two-year-old Candice Fuller welcomed son Harvey at 5.55am but by 12.30pm she was whipping up a festive lunch – much to the delight of her four-year-old daughter Sienna. Self-employed make-up artist Candice, from Daventry, Northamptonshire, even managed to open her Christmas presents with all of her family just half an hour after the birth. She said: ‘I couldn’t believe it when my waters broke on one of the busiest days of the year. Candice said it was ‘a crazy day’ but ‘the perfect present’ and it couldn’t have been planned better. She added: ‘Sienna was absolutely over the moon – she didn’t know what to get excited about first because she ran into our bedroom holding her stocking but we weren’t in there. ‘So when she came downstairs wondering where we were, I was holding Harvey and she just burst with excitement. Candice, who lives with her 34-year-old husband Karl, an engineer, phoned her midwife after her waters broke at 2:30am on Christmas morning and she was in the birthing pool by 5:00am. She said: ‘We just couldn’t believe it! Karl phoned my mum and dad because we were worried about looking after Sienna, particularly on Christmas morning. But the strains of such a dramatic pregnancy didn’t stop Candice from getting down to business and cooking Christmas dinner for the family. After a short break, she set about cooking the meal with her mother Brenda, 64, while husband Karl and father Jim, 63, looked after the two children. Amazingly, the only thing that was sacrificed with the meal was the cauliflower cheese, as Candice opted for plain cauliflower in the mammoth effort. She said: ‘We all went down together to open our presents before starting on the Christmas dinner – it was all overwhelming really. 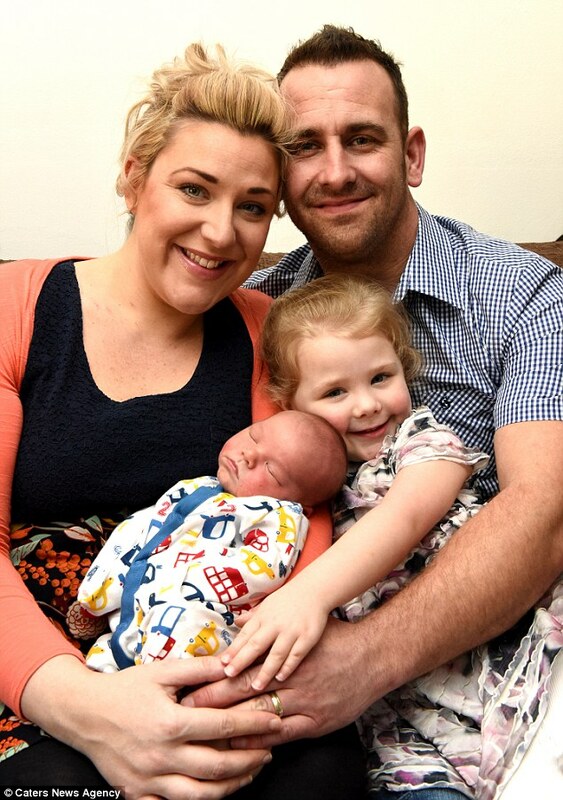 ‘I was shattered after the birth but I wanted Sienna to have a proper Christmas that she could remember so we plugged away and got the dinner cooked. New-born Harvey weighed 8lb 3oz and now Candice is looking forward to bringing him up with the help of his loving older sister Sienna. She said: ‘He’s adorable but the way Sienna’s been with him is amazing. We can’t wait to bring him up and properly welcome him into the family, particularly after such an unforgettable Christmas Day.